Thamizhini's Dictionary is growing very fast and as of now it almost has minimum of 100 verbs. We are very sure that we have taught her only 25% of words, remaining all are her efforts in knowing words. She just absorbs what others talk and says! One day, She was playing on the bed and when I called her for dressing, she told me "Amma 2mins". I'm astonished to hear that lovable cute words from her. The other day, She was asking me something and I was not paying attention to her, She pulled my pants and pleading me, "Amma Please"! Oh God! she listens what we talk and uses for her context. And she knows to tell, Amma ku, Appa ku like that, when her Ayah brings milk to her, she says "Pappa ku Paalu". She knows everyone's name, who play with her. When we ask for her friends, She says Na(r)en Anna, A(k)chiya akka, Neya Akka, Nithu Akka, Tha(r)aa Akka, Siddhu, Sandheep, Parthiban and so on. Yes, she pronounce correctly for last 3 names. 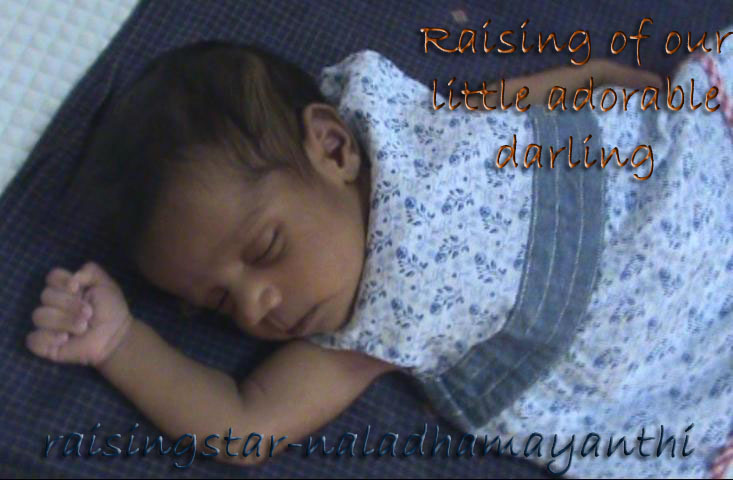 "Pamiyini (Thamizhini) / Paappa bathma utkare", bathma means "Bathirama"
She says. Nalla pulle, Ketta pulle, Ayi pulle and even good girl, bad girl, dirty fellow. I know this list will be growing and growing.... Never ends!